All you have to do is tell me which title you prefer. What I don’t have is a title for the overall series, though I have ideas. So I’m putting it to you for a vote. Here’s a little info about the series that might help you choose the winner. Each of the three books centers on a different hike, despite the fact that as the first book opens, Nathan has never hiked a mountain in his life. That all changes because of his love for two other young men and his confusion over his feelings. By the time he has been to the summit of Chocorua, he knows he must keep hiking. As the second book opens, a couple of years later, Nathan has begun to see himself as something of a mountain man. His hiking chops are serious, and the self-confidence his adventures give him are a huge part of his self-image. We follow Nathan along the Kalalau Trail on the western shore of Kaua’i, where he's conflicted about his feelings for another mountain man. The Precipice Trail, on Mt. Desert Island in Maine, is indeed a precipice, both as a dangerous trail and as a potential turning point in Nathan’s life. In the third book, he faces a crucial choice: Does he continue with the mountain-man self-image he’s worked so hard to perfect, or does he follow his heart? And is it really necessary to choose? 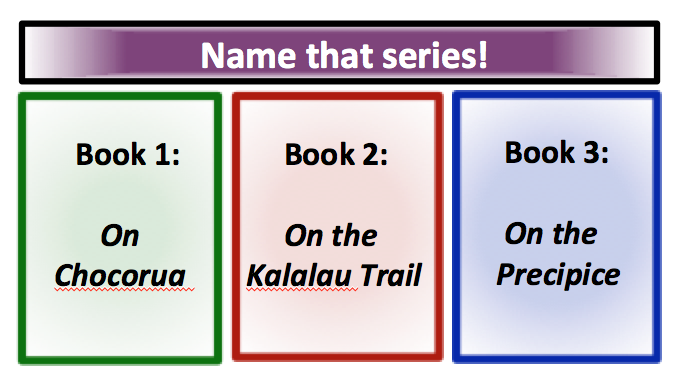 So let me know which series title you like better, and when the votes are tallied I will let you know which title won and whether you were among the first ten to vote.